If you still want to know more about the process, read on for more in-depth information. Vote tallies will be done by modified IRV (instant-runoff voting), also known as preferential voting process. 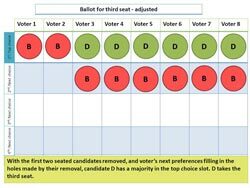 If there is a simple majority of first preferences for a candidate (i.e., the candidate is the top choice on more than 50% of the ballots), then that candidate takes one of the seats and is removed from consideration for all the other seats. After a candidate is seated, the initial ballots will be recounted to fill the next seat, and the next, until all seats are filled, removing from consideration the candidates selected for the previous seats. 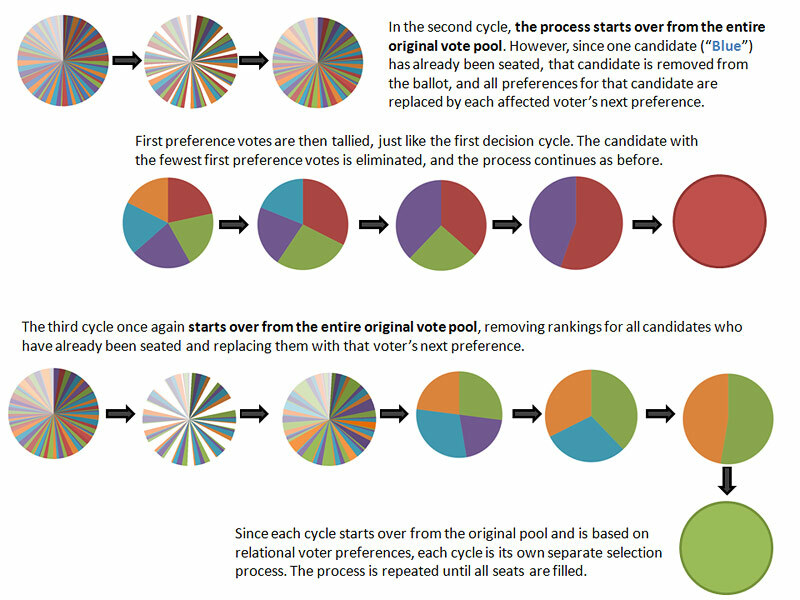 Since each vote starts over from the original pool, based on voter preferences, each round is its own separate selection process. The candidate with the fewest first preference votes is eliminated from this cycle. The votes that would have gone to the eliminated candidate are replaced by each affected voter’s next preference, and the votes are re-tallied for the remaining candidates. This process is repeated until a 50% majority is reached and the seat is filled. Once that seat is filled, a new cycle of voting begins for the next seat, returning to the initial ballot. 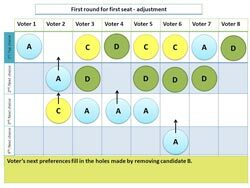 Any candidate already elected to a seat is removed from consideration, and all votes for those candidates are replaced by respective voters’ next preferences. After this cascade, first preference votes are re-tallied. Steps 1 and 2 are repeated until a simple majority is reached for each seat. 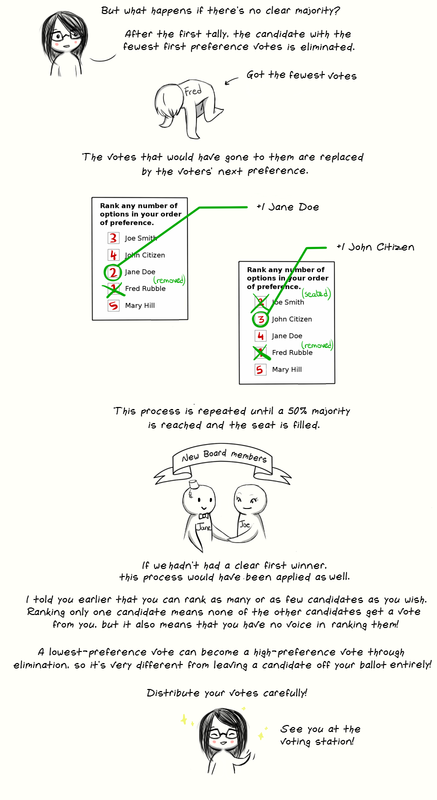 This process lets us fill multiple seats with a single ballot and without any hierarchy among the elected candidates. A candidate with the most votes overall may not necessarily get a seat if those votes aren’t as high-preference. Similarly, a candidate with few first-preference votes early on in the process may win a seat as candidates are eliminated and preferences cascade. See the graphics for examples! 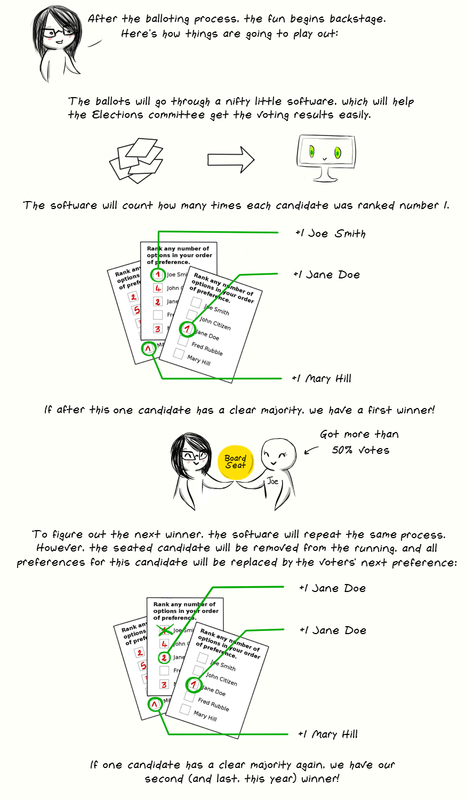 A lowest-preference vote is different from leaving a candidate off your ballot entirely. A low-preference vote can still eventually cascade into a high-preference vote through elimination of other candidates in that cycle. Leaving a candidate unranked means they don’t get your vote at all. Since, after the one required ranking, voters can rank as many or as few candidates as they wish, voters have many options for how to distribute their votes. But be careful — ranking only one candidate, for example, does not give that single vote any more “weight” and means you have no voice in ranking the remaining candidates — but it does mean none of the other candidates get any vote from you. Distribute your votes with care! We’ve had several awesome contributors put together graphical representations of the process, as well as a step-by-step look at some sample voting data in raw tabular form. Take a look! 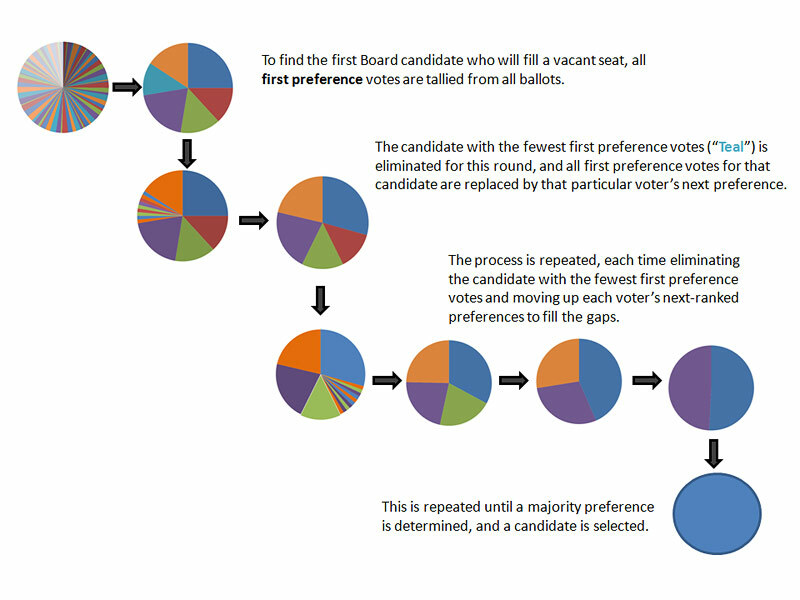 Below is a macro view of the process, representing votes by aggregate as slices in a pie chart. Please note that Purple, who was last to be eliminated from the first cycle and had many first preference votes in the first round of that cycle, did not get a seat in this example. Meanwhile, Red, who had relatively few first preference votes in the first cycle, won a seat in the second cycle. Wondering how this can work? Check out the next set of images, which shows how the votes move around! The rest of this set of images, as well as the long version of the IRV explanation, the text-based example, and the tabular example are all below! Please note that B had the most votes overall, but is the only candidate to not win a seat, because those votes were lower-preference. Instant Runoff Voting is an election system that allows a decision with a single round of voting by asking voters to rank their choices in order of preference. 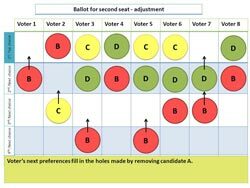 The biggest advantage of this system for our purposes is that generally, this eliminates the need for additional balloting to break a tie and elects an equal, rather than hierarchical, cohort of candidates. We use Opavote’s IRV system. 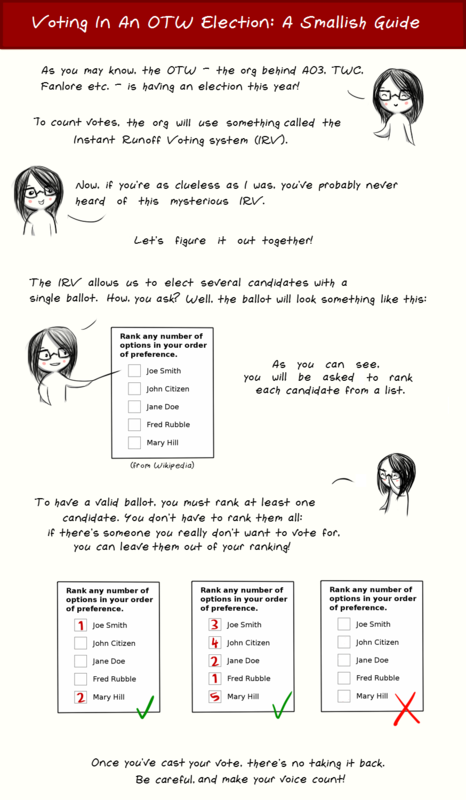 Voters use a ballot that allows them to place candidates in a ranked order. Any candidate not placed on the ballot is given no weighting in the ballot. 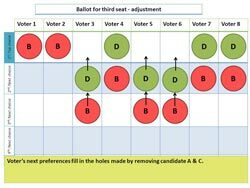 If a voter casts a ballot which ranks candidate A as fourth preference and candidate B as second preference, but lists no first or third preference, then the system represents candidate B as that voter’s first preferences, and candidate A as their next most preferred candidate. 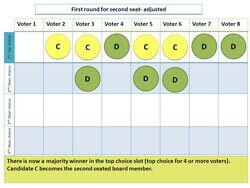 IRV is a system that determines only a single winner, and as the OTW elections are meant to fill all available board seats without establishing a hierarchy or ranking for the incoming members, winning candidates are removed from consideration. This leaves all of the other candidates, and their rankings, in place. 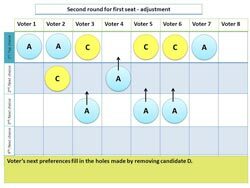 Any gaps left by the eliminated candidates are filled by cascading each voter’s preferences for the remaining candidates, in the same manner as the example above where a voter picked only a second and fourth preference. The system then automatically tallies the votes again, returning a second winner. This process nearly eliminates the need for tiebreaker votes. If there is a tie and there are enough seats available to seat all the tied candidates, then all those candidates are seated and, if necessary, the process can continue. 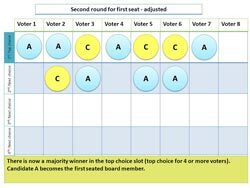 If there are not enough seats for all tied candidates, then the number of second preferences votes for those candidates will be tallied next, and so on until the seats are filled. Only in the extremely unlikely event of a tie for insufficient seats where all preferences match exactly is additional voting necessary. It is important to understand that this system revolves around relational voter preferences — all candidates in relation to each other, rather than absolutely. This is what is behind the cascade of preferences as candidates are eliminated, and also what allows this system to fill multiple seats with no hierarchy among the elected candidates. The cascade of votes makes it difficult (as well as undesirable) to draw clear hierarchies, even in the first cycle, where the candidate with the most votes overall is not necessarily the candidate who will end up with majority first preference and win a seat. First preference votes are tallied. The candidate with the fewest first preference votes is eliminated for this round, and all votes for that candidate are replaced by that particular voter’s next preference. The process is repeated, each time eliminating the candidate with the least votes and substituting the voter’s next preferences for the remaining candidates, until a clear majority of first preferences is determined. That candidate is seated. All votes for the candidate who won Round 1 are replaced by each affected voter’s next preferences. First preference votes are then tallied, just like the first round. If there is no simple majority winner, the candidate with the least votes is eliminated, and the process continues just as it did before until a majority is reached. The third round also starts over from the entire original vote pool, removing votes for all candidates who have already been elected and substituting that voter’s next choice. 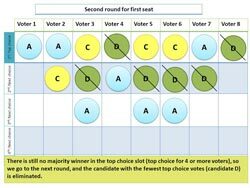 Since each round starts over from the original pool, based on voter preferences, each round is its own separate selection process. To see an example of raw voting data in tabular form, check out this series of spreadsheets: IRV Spreadsheets. This works from the same data as the above example, but follows on from the first cycle through all four cycles. Click through the sheets, numbered at the top, to watch the process in action. This example also includes a tie, showing how the modified IRV process nearly eliminates the need for tiebreaker votes. We’d like to thank the many contributors who have helped make this post possible, including Aja, Allison Morris, Candra Gill, Ira Gladkova, Kristen Murphy, Renay, and Seventhe Dragomire. This version of the post was updated in 2015 to eliminate discussion of the Drupal module for running IRV, as we no longer use that software. We hope this post has helped you understand the voting system and given you tools to help plan your vote. Happy voting!